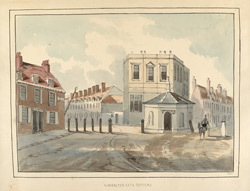 This picture depicts the wide streets at Gibraltar Gate, Deptford. Despite the town's reputation as a major industrial centre in the 18th and 19th centuries, the large majority of its resident families were poor. Most of the men were unskilled labourers doing seasonal work at the dockyards. During the 19th century the town was home to chemical works, engineering works, gasworks, soap and candle factories, sawmills, coal and timber wharves, paintworks and breweries.